Robert joined Cushman & Wakefield | CRESCO Real Estate as a Principal in 2003, bringing with him 18 years’ experience with several national real estate firms. While representing a wide array of landlords and tenants over the years, Bob has extensive experience involving lease term negotiations including rental rates, options, tenant improvements, tax and lease abatements and lease article modifications. Additionally, his broad knowledge of the complexities of property disposition, acquisition, value analysis, build-to-suit and land development have greatly aided in the success of many property transfers and transactions. Bob has also negotiated, for his clients, large tax abatement packages with various governmental authorities saving millions of dollars on real estate, personal property and payroll taxes. Since entering the real estate industry, Bob has on average completed over 50 deals a year ranging from approximately 2,000 to 500,000 square feet. Bob has been successful in building and maintaining business relationships over the years evidenced by the longevity of marketing various exclusives and the representation of many clients on multiple assignments during the course of his career. Prior to CRESCO, Bob worked as a Property Director for Equitec Properties Company. During his four years at Equitec (1985-1989), he handled the leasing and management of over one million square feet of commercial and industrial space in the Greater Cleveland suburban markets. Under Bob’s direction, the Cleveland portfolio of properties became one of Equitec’s top producing real estate assets. Additionally, Bob served on Equitec’s national acquisition team analyzing real estate investment opportunities from coast-to-coast. 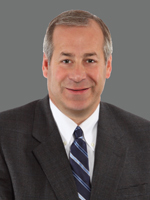 From February 1989 until April 2003, Bob worked for Ostendorf-Morris Company, which became Colliers International. He served as Vice President of the Industrial Services Group, was a consistent top producer and responsible for aiding in the growth of the department and the training of many new brokers. 20 WATERFORD LANE 20 Waterford Ln.